We have been established in Guildford for over 18 years but we have been in the trade for more than 22 years. We also have a Structural Engineer and Architectural Consultant who works closely with us when required for structural alterations and building works. 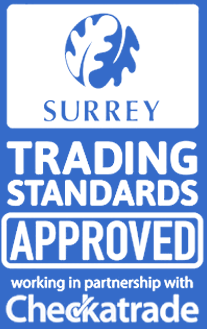 We are members of Checkatrade and Surrey Trading Standards, we have more than 100 references on our checkatrade page. We are fully insured and offer free estimates. Our entire team are highly experienced in their fields and we offer a friendly, personal service to our clients, keeping them fully informed as their project moves on. We can cover all property refurbishment, renovation, remodeling requirements including removal of walls and insertion of RSJ’s if needed, to allow for open plan style living. Installation of new bathrooms, kitchens, plastering, plumbing, carpentry, flooring, electrical, painting and decorating. We can offer project management so that the customer can leave everything to us and not have to deal with multiple trades. We have accounts with – Howdens, Magnet, Benchmarx, Travis Perkins, Brewers, Tile Giant, Williams, and many others. Here are some of our projects that we have recently complete. To see more images, please visit our gallery. I’ve used David to paint three properties (one my home, two rented) and to tidy up after tenants have departed. This job was a small one but as always he was helpful, trustworthy, tidy and efficient. I would not hesitate to recommend him if you need a decent decorating job doing. Friendly, reliable, flexible, completed all work to a high standard and responded quickly to any minor snagging issues. David organised and co-ordinated the work in a very pleasant and efficient manner, arranging the plasterer and roofer for us, and everything ran very smoothly. The work was completed to an extremely high standard and we will have no hesitation in using his services in the future.